It was a rainy Saturday when I and a few bloggers visited Plateau in Canary Wharf by invitation; we were glad to get our soggy selves indoors and excited to be learning how to use a Josper grill. 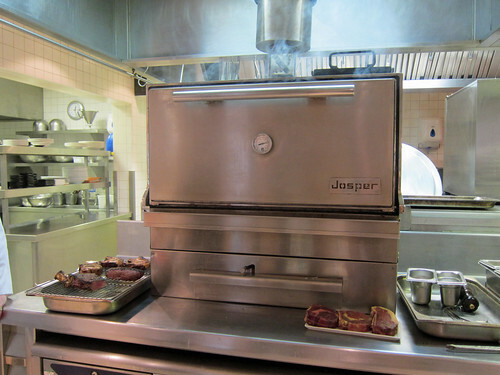 These indoor charcoal grill ovens seem to be the cool thing to have in your restaurant kitchen with many places using their Josper as a bit of advertising. I had no idea they were Spanish and to my surprise, I recently learned that it was two Catalans who invented it – Josep Armangue and Pere Juli – over 40 years ago. The grill has been designed to, of course, charcoal grill but the closed doors supposedly keep the moisture in as well, like an oven. The restaurant was much bigger than I expected and had great views over the grounds of Canary Wharf. Head chef Allan Pickett and manager James Jones welcomed us to their restaurant warmly and after some coffee to further warm up, we headed into the kitchen. Andrew Turton from Turtons of Devon, the butcher from whom they source all their meat, had come along and first gave us an explanation of their beef and the cuts. That’s Andrew below and Allan on the right. 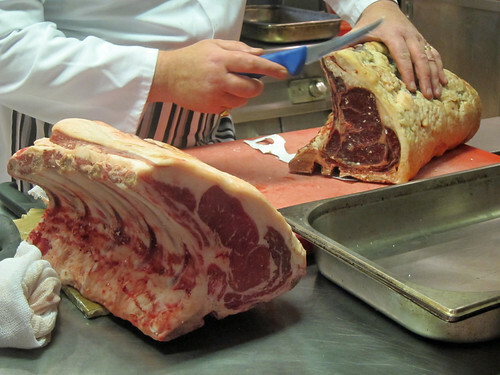 Look at the difference in colour between the fresh and the 21 day aged beef. We were also joined by chef Chris Brennan from Jestic, the UK importer for Josper, who came along to help show us the grill. It looked like a beast. We learned what that the Josper grill was capable of reaching temperatures of 500C and perhaps even more and being humongous, it could cook quite a few steaks at once. It was evident that Allan was very happy with his! But first, we would be making our own lunch to be grilled. 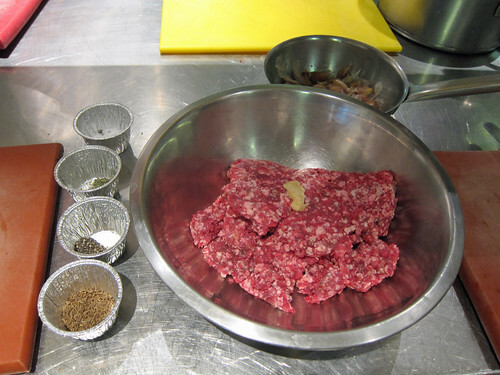 I was assigned to burgers and set to work mixing salt, pepper, thyme, caraway seeds and mashed confit garlic cloves into some minced beef. 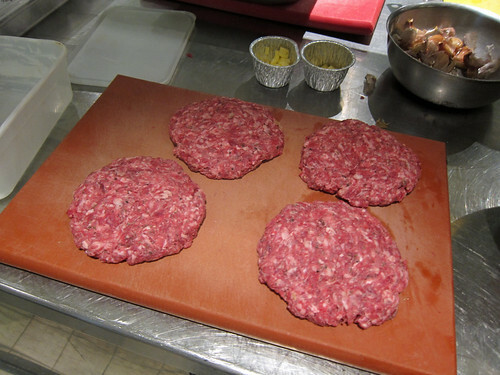 After a bit of bashing and some precision division, I had four burger patties on my board. 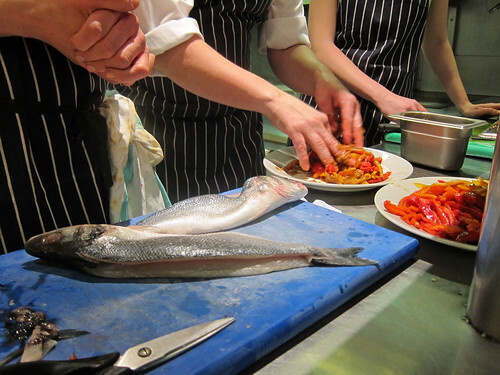 The others were assigned to fish duty, first peeling peppers roasted in the Josper grill before mixing them with caramelised onions. This was used to stuff some beautifully fresh sea bass. We could then use the grill to cook our food! 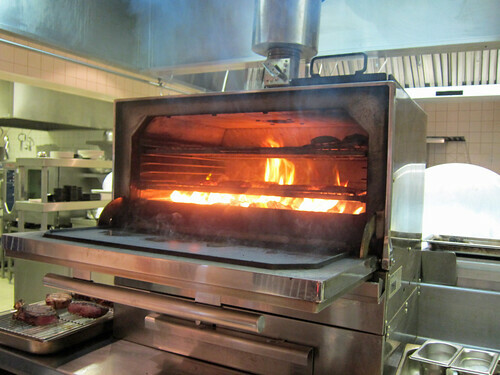 Unfortunately, all my bravado went out the door as soon as the door to the Josper grill was opened. It was positioned quite high and my face was at about coal height, meaning I’d have to tiptoe to put anything inside. As I rather enjoy having a face, I let Chris take care of everything. 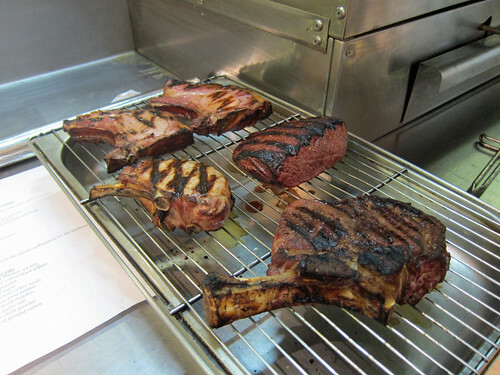 He first grilled a few pork chops and beef steaks from Turtons for tasting. 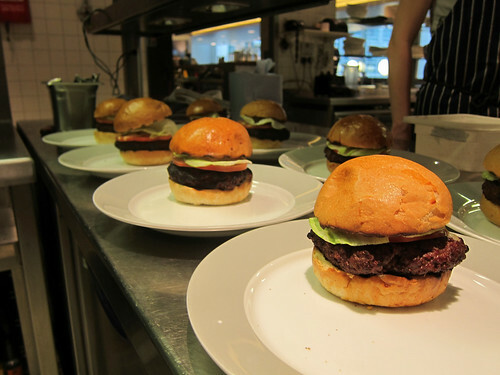 It was all impressively fast – perhaps only a couple minutes in the Josper for each side. The steaks were outstanding as was one smoked pork chop in particular. Grilling over charcoal really is the best. Then in went our food. Oh, what pride I felt as my burgers came out! 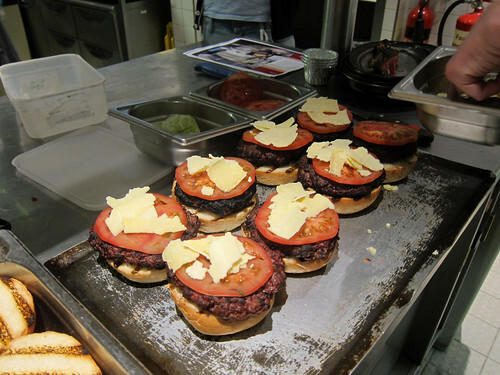 Allan had briefly toasted the buns in the grill (I reckon they were in there for about 10 seconds) and assembled them, topping the tomato with cheese and running it again in the grill until the tops were all melting. After everything had been cooked and plated, we moved to the dining room with our food. 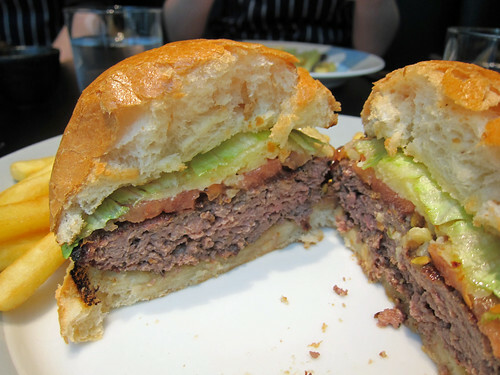 Our burgers were a bit overcooked for my liking but still delicious – I liked the addition of the caraway to the meat. 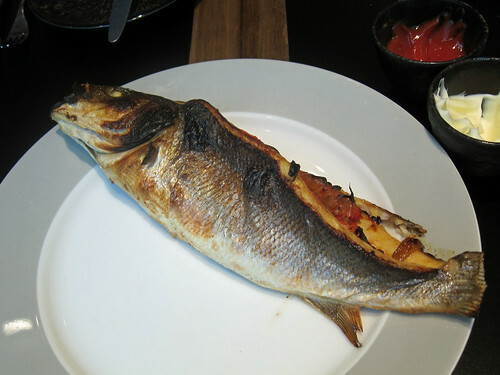 Whoops, after all that burger action I almost forgot about the stuffed sea bass. It was beautifully moist inside and all crispy skin outside. And the onions and peppers – gorgeous. Allan had even put on some spiced pork ribs, a recipe for which he was testing. 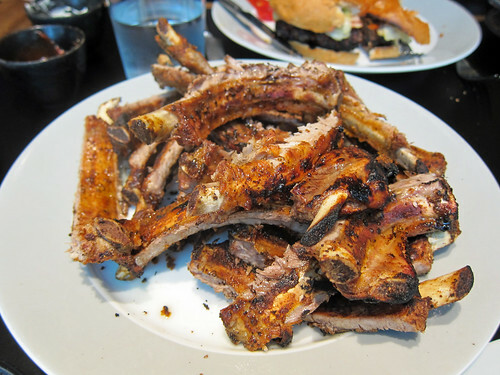 He had first boiled the ribs before sprinkling on a spice mixture and then grilling them. They had a great chilli burn to them and were pretty tasty though I still prefer my pork ribs to be slow cooked in an oven. 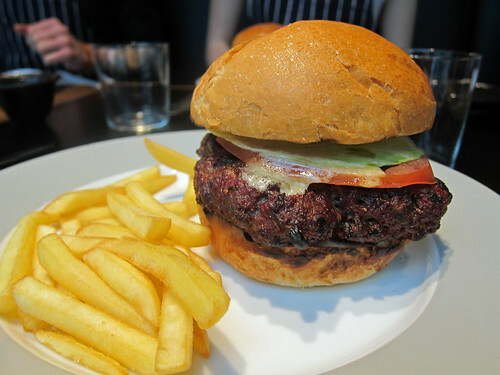 That lunch brought our lessons to an end – and it was a good thing too as we were all about to burst. Thank you very much to Issy at Sauce Communications for the invitation and thank you to Allan, Andrew, Chris and James for this fun day! 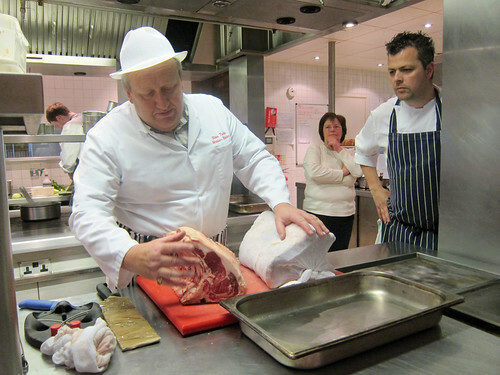 Wow – there’s such a difference between the fresh and aged beef!! Those are some pretty impressive grill marks too, hehe. It was pretty great being in a restaurant kitchen! wow I’m jealous. 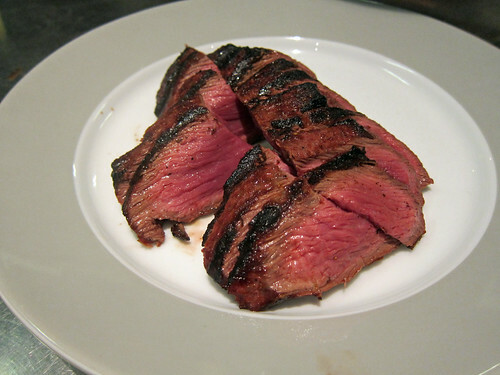 the steaks look outstanding really, perfect cooked and still pink. i’m sure everything tastes much better on a proper charcoal grill rather than the oven, but woah that thing is massive. They told us that some people buy one for their homes! It’s insane! That looks great Su-Lin. You’ve given new meaning to the term “saving face” LOL!